Oftentimes in the game of basketball, the most respected and lauded players are those that score the most points. Just look at the top five scorers of all time: Kareem Abdul-Jabbar, Karl Malone, Michael Jordan, Kobe Bryant, and Wilt Chamberlain. All five of these men are considered to be some of the greatest ever, and it&apos;s hard to argue otherwise. But what about the guys who set up plays for these top scorers, dishing out whopping assist numbers on a nightly basis? Without an experienced playmaker like John Stockton, there&apos;s a good chance Karl Malone wouldn&apos;t crack the top ten scorers list. 13 years ago today, on December 13, 2000, John Stockton continued to build his legacy as he surpassed the 14,000 career assists mark. His Utah Jazz suffered a loss to the Milwaukee Bucks, but Stockton&apos;s assist cemented him as the all-time leader during that period. At the time, Magic Johnson trailed far behind at number two with 10,141. Since 2000, Mark Jackson and Jason Kidd have managed to leave Magic behind, but John Stockton remains as the NBA&apos;s all-time assists leader with 15,806. To put things in perspective, the NBA&apos;s current assists per game leader, Chris Paul, has 5,712 career assists as of today. When it comes to sneakers, Stockton may have been one of the most deserving players of the &apos;90s to never have an official signature shoe. 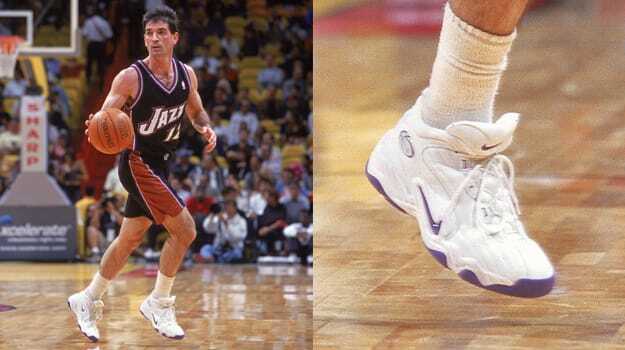 Throughout his professional run, John Stockton wore a number of Nike models, including the Andre Agassi-endorsed Air Zoom Challenge. During the 2000-01 season, Stockton opted for the Nike Air Props Uptempo. If you&apos;re interested in picking up a pair of these vintage kicks, there&apos;s a size 11 in the black colorway available on eBay for $300.